Jamie Green was a winner in Hockenheim. © ITR. 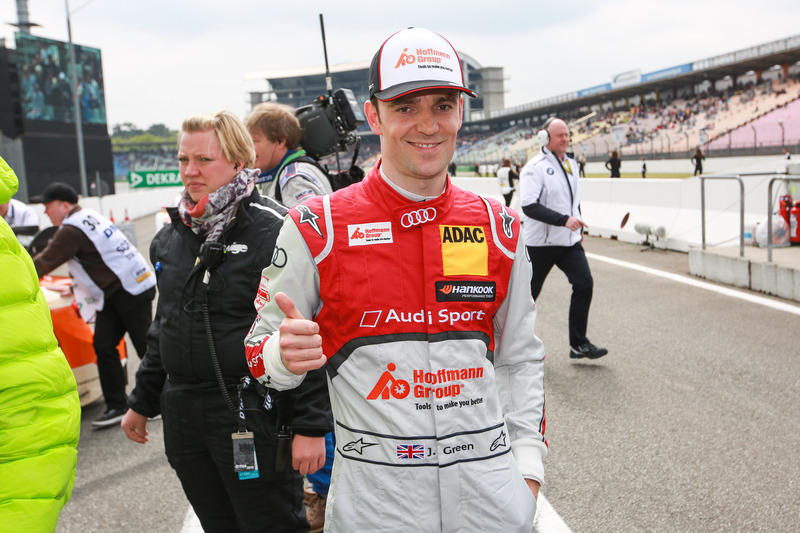 Jamie Green grabbed his first with Audi since his move to the marque in 2013, with an inch perfect performance in Race One at the Hockenheimring. After taking pole, Green – driving the Rosberg Audi – made a stellar start to leap into a supreme 2.3s lead over HWA Mercedes man Pascal Wehrlein after one lap, stretching that to a 3.6s gap when the first of two safety car periods began on lap 12. Thereafter the unbeatable Green pulled out another gap over the final ten laps to win the season opener by 2.3s ahead of Wehrlein, to celebrate his first DTM victory since Norisring 2012. Paul di Resta (HWA Mercedes) took 2nd from Wehrlein on the fifth tour and held the position admirably until Wehrlein fought back to the runner-up spot four laps from the end. Edoardo Mortara assumed 4th, while former champion Mike Rockenfeller took 5th. A poor start dropped Nico Müller from 4th to 6th off the line, while Maxime Martin finished 7th in his RMG BMW. Adrian Tambay was running 7th for a time, until an off in the gravel in the stadium section while battling with Martin, Mattias Ekström and reigning champion Marco Wittmann caused Tambay to retire. Ekström, meanwhile, pitted but continued on to finish 12th. Timo Glock came from 20th on the grid to claim 8th after late moves on Wittmann and Augusto Farfus, who would go on to finish 9th and 10th respectively. The first safety car was triggered when Daniel Juncadella got beached in the gravel at the Sachs Kurve. Following a brief green stint, it emerged again when an out-of-control Martin Tomczyk lost the rear of his Schnitzer BMW while battling with Lucas Auer (ART GP Mercedes) into the hairpin. From there, a backward sliding Tomczyk rammed the right rear of Gary Paffett (ART GP Mercedes), before pinning the helpless Auer in the hairpin. Robert Wickens endured a first lap incident that caused him to retire, while Timo Scheider and Tom Blomqvist quit the action when tagged by Antonio Felix da Costa early on. Miguel Molina retired when he was clipped by Maximilian Götz.